The future power industry is solar power which was identified by many but implemented less in India. In the developed and emerging nations we find solar power existing in an great form where as in India we find street lights to be under coal based power supply. Power cost has finally taken an toll over the rising cost of household expenses. People in Delhi are now feeling the heat of rising cost followed with an inflation of around 7% to 9% range. The cost of coal has gone up significantly as well as the cost of production of power. According to some estimates, the country will see a shortfall of about 70 million tonnes of coal this year. More than coal price the current problem is the high cost of coal due to import of the same, Indian government has become supporters of the import of coal. Coal supply is not only acted as a constraint but also as an problems for new power companies too. No new investments are coming into the power sector due to increase cost of production of power. Imported coal has eradicated the cash flow projections of the power projects. The reason behind the failure of solar based power system in mass basis in India is that imported coal and domestic coal based power supply engages thousands of middlemen to make money. More over the Indian political system makes billions out of coal based power supply system. In solar system one doesn’t find such an recurring income based business process. This is one of the reasons why Indian economy fails to develop at public sector point. Coal India is the biggest supplier of coal in India. According to Coal India's production target, it will only be able to supply 65% of the requirement for plants that have come up after December 2009. This effectively means that power units will be able to operate only at 55% plant load factor and will need imported coal to enhance capacity utilization. Hence there will be massive power shortages or otherwise there will be high cost of tariff for power companies. As mentioned earlier any shortage in coal will be met from import but we find the cost of import has also significantly gone up by around 15% to 25% range. For example Indonesia has imposed a 25% export tax on coal. Earlier it was found About 9,000 megawatts, nearly 10 percent of India's total coal-fired capacity, became unviable last year after Indonesia changed rules on coal prices. India imports about 12 percent of its coal requirements and sources 70% of that from Indonesia, the world's largest thermal coal exporter. Hence this is one of the prime reasons for the sudden upward spike in power tarrifs. One will be shocked to find that power tariffs will rise by 50% from the present price levels within the next 5 years. The only logic behind is that coal fuels will comprise more than half of India's power capacity of 191,000 MW and will be required for 85% of the 76,000 MW additional capacity targeted in the next five years. It is further being blessed by our Environmental Practices and its law. Slow environmental clearances and land acquisition have led to stagnating coal output in the country and have increased our dependence on imports. At the same time it will illogical to pass the blame of not getting domestic clearance for mining. What will happen if after mining the coal blocks you find there is no coal within the blocks? Thanks to the GDP of India that currently it is under slow growth phase. If Indian economy should have grown at 8% then the power companies should have went for an wild cry. Currently all power cost has gone up and in the near future it is being expected that the coal prices would remain the bottle neck for the power companies. Increasing cost of imported coal is only going to increase the prices of power to the end user. I fail to make an calculation about the future price level of power which we consumers have to pay. But once Indian economy gets back on its feet the demand of power and cost of power to the end user will increase to create a history in the Indian economy. I find we the common people have become dumb and have created a mindset where we easily adopt to any price hike without any other way out. More over in this power game we don’t have an alternative product or solution just like we got when the gas prices went up we immediately found a substantial jump in purchasing induction cookers. Again that cooker also runs on the power of electricity. I can’t calculate where the gas prices and power prices will head in the coming days. India being a high population economy should have low prices so that volume based and mass based consumption can happen. Hence that leads to drop in prices which are according to the economic principles but we only find high prices and less consumption. 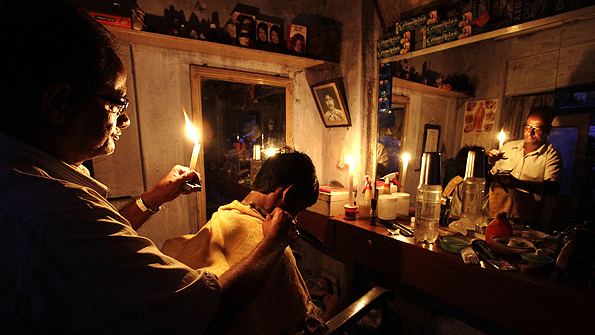 Power distribution companies are burning their hands due to high cost of power. Kit has been found that state governments are refusing to raise tariffs, unwilling to increase the burden on distribution utilities, which are mostly controlled by state governments. They probably lost around 800 billion Indian rupees ($15.8 billion) in 2011/12, higher than 635 billion rupees in 2009/10, rating agency ICRA estimates. Now when coal prices are rising up we find there are two solutions for the Indian government either subsidies or pass on the price to consumer. At the present moment India is having an fiscal deficit of 6.7%% hence there are negligible chances for the government to press the button of subsidy hence tariffs took the call. In the coming days and years we find less probability of power tariffs to climb down, it will only increase and within the next 5 years it will increase by 50%. In these situations we find alternative energy like solar energy which can be easily placed in the urban society will give relief from the rising household budgets. In India it has been noticed that we don’t pay any value to any thing which we get easily. Only when a price is being tagged with an product then only we identify the true value. Strange but true. We find that now we Indians should understand the real value of power and should opt for solar energy based power systems so that both money and natural resources are being saved. In India the summer seasons are behind torture for any one which needs no explanations. We find that whole of India burns with an heat degree with a range between 40 to 55 degree centigrade with an time frame of 6 months on an average in an calendar year. Hence India has a huge potential climate for solar power but the focus of the government and also of the common man of India is very poor and dim towards the potentiality about solar energy based power consumption. But among all these draw backs there are two states in India made an huge turn around in by identifying the potentiality of solar power they are Gujarat and Rajasthan.. Gujarat has dominated the solar power movement in India by contributing two-third of the 900 mw of total solar power generation. The state has the country’s biggest solar park in Charanka village, which generates 214 mw of solar power out of its total capacity of 500 mw. The park has been recently awarded for being both innovative and environment-friendly by Confederation of Indian Industry (CII). Rajasthan comes second after Gujarat in terms of solar power generation in India. Being the sunniest state of India, it has tremendous solar power potential. According to Bloomberg, Reliance Power insta lled 40 mw solar power at the Dhirubhai Ambani Solar Park in April this year. Furthermore, according to Tip News, a 250 mw “compact linear fresnel reflector (CLFR)” plant is under construction by French energy group Areva for Reliance Power in Rajasthan (targeted for a May, 2013 start). But the questions comes in mind why only two states in India has adopted this where as remaining other 27 states are out of the game plan. One of the wildest things is that when the power companies laid out the power project cash flow they took domestic coal supply into the account but in the last 3 years the picture has turned upside down. Now imported cola has increased the cost of production which has affected the ROI and ROA followed with the profitability of the power companies. Why doesn’t the street lights don’t get power based on solar and why based on coal. The change would lead to an substantial savings for the state and central governments. Well that’ is because Indian political system is very much intricate into the corporate business.